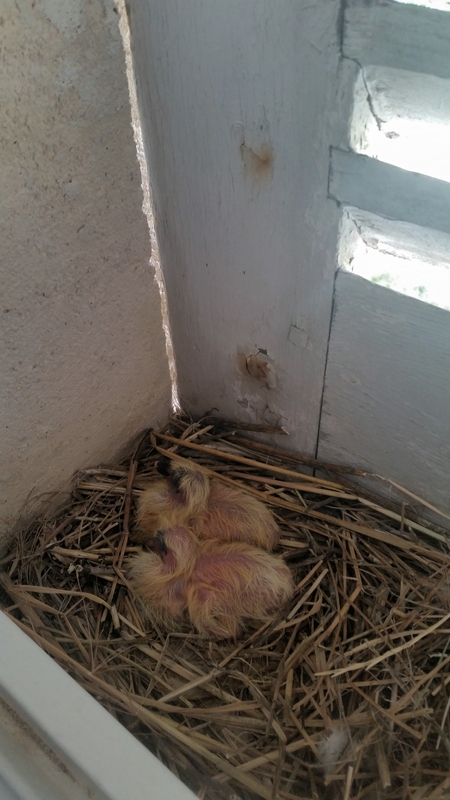 Look what I found, nested just outside the window of what used to be the pink bathroom: baby pigeons. I thought of pigeons as city birds but here they are. I know for a fact that pigeon poo can quickly destroy a building; one of the things I looked for when I first visited the house was evidence that the birds had moved in, which would have meant structural damage far beyond what I could have afforded to repair. So I’m telling myself that wood will rot but stone can take the abuse, which I hope is true, and that they’re not pooping on the window, which I want to keep. Worst case, they are pooping on the shutter, which will be replaced, anyway, along with its rotting buddies, when I find a stack of cash to do the job right. So the babies stay; may they grow and prosper. Missing stacks of cash are also keeping me from the landscaping that I want to do. Apparently there are so many tree stumps and stones in the ground, not to mention the “cadeaux empoisonné,” the debris that the workers abandoned all over the place, that there is nothing for it but to scrape the soil surface and start all over. Love to but that’s not in the cards right now. Instead I am trying to figure out what to do until my money tree bears fruit. It’s all about finding the right strategy. I’m reading Christopher Lloyd’s book, Meadows. If I can’t plant a decent lawn (Julien just broke a lawnmower blade on a rock), why not make a virtue of whatever is already there? I’m hoping that the late, great Mr. Lloyd will show me the way. Next to the house, I’d prefer something a little more civilized. Long, long ago and far away, I wrote a thesis on a Harvard-educated Los Angeles landscape architect, Edward Huntsman-Trout. HT is well known for his many commercial projects. That’s understandable: hardscaping, the core of a commercial design, lives. Plants die and get swamped by weeds or swapped out for easier-care substitutes. But when I spoke to his friends, they admired his character, first of all, and his knowledge of plants. They spoke admiringly of the way he used plants to shape spaces. In much of his later domestic work, he liked to borrow an idea from Italian landscape design. He would plant a more formal scheme near the house which, as the planting moved away, would become less formal, eventually blending into the surrounding countryside. I had the privilege and great good fortune to spend an afternoon with his widow at their house in Mandeville Canyon; at that time, that far back into the canyon, it was pretty wild. I was so taken with her that I didn’t really look much at the garden. She loved the house, which was his design, and spoke at length about that. So all I can really tell you is that the garden didn’t look designed. It looked as if it had always been there, waiting for the right house to complement it. Where were my advisers? The house and garden probably should have formed the core of my thesis; back then I was out of my depth and I’m sorry to say I missed a great opportunity. Anyway, for the next little while I’ll be studying the masters and hoping some of that brilliance rubs off. Because I was traveling, I was a month without Jacques. That was a long, long month. Though I like to travel and Jacques likes to stay with Julien and his family, we are happy to be reunited. Here he is, trying to convince me that my best form of exercise is not rowing, not Pilates, not yoga, but chasing him and his little frayed toy all over the house. If I do sit down on that yoga mat he sits right in front of me and either talks me into giving him a little doggy massage or licks my face. Not a lot of stretching gets done. He has also inserted himself into my meditation practice. When I bought the house I thought it would make a deluxe hermitage and so it has. 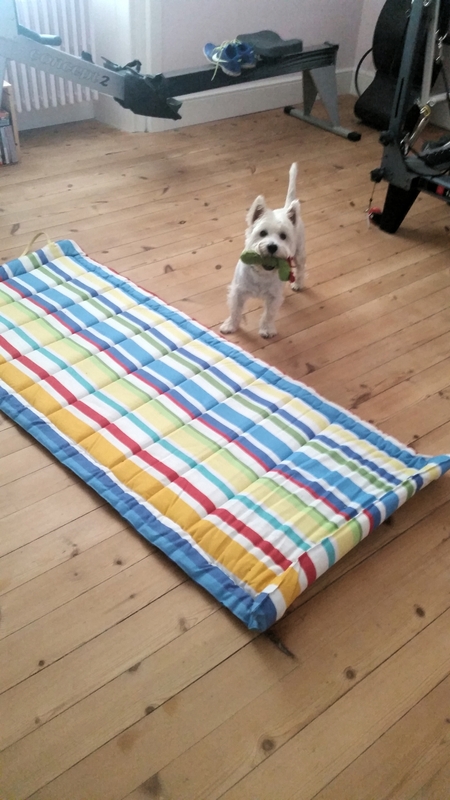 However I can’t put the little zafu on the big cushion because then there is no room for Jacques and he will bug me and bug me until I make room for him. So I move the zafu and scoot over. 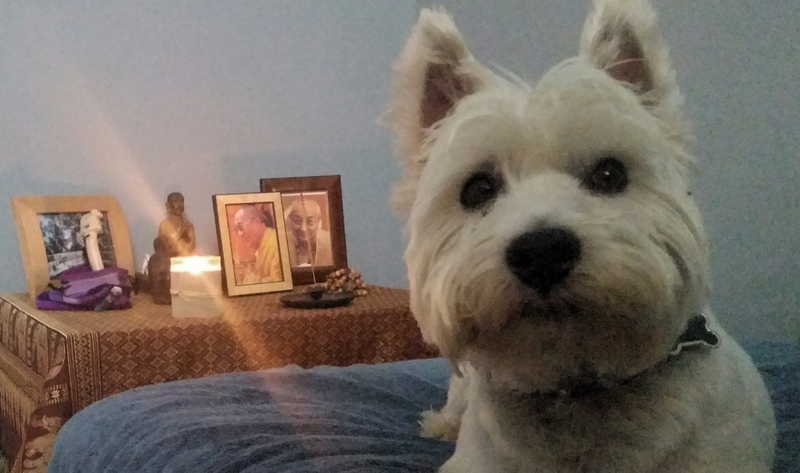 Jacques settles in beside me and sits very still, a little white Westie mountain of calm, until the meditation timer goes off. Then he grabs his toy and makes me chase him around. I guess that’s its own way of living in the moment. When I had my eldest daughter I read an article that suggested I leave the vacuum cleaner in the middle of the room, plugged in to imply to visitors that I was just about to do the housework. This made me feel much calmer about the chaos that abounded in my newly mothering state. I suggest that you leave a shovel strategically in the middle of the garden, a wheelbarrow with a few rocks in it casually somewhere else and other gardening accoutrement about to imply that you are mid-landscaping when people come to see you. This may make you calmer. Your Zen Dog will help you in your quest for a higher state too. As a complete throwaway, I have held two world records on the Concept 2. Both hurt greatly but the sense of accomplishment was greater. This is what you will feel when you finally find the money tree and get your garden as you like it. Bon courage! I am now going to look up this book ‘Meadow’ though I may get distracted by Huntsman-Trout – I am becoming more Senior by the moment …. Lawns are overrated. I would like to get rid of ours, small though it is. A nice vegetable garden instead. A lawn was OK when our kid was little and running all over it, but now, it’s just brown stubble (since we are environmentalist/cheap enough not to water). We aren’t in a lotissement, but we aren’t fading into the garrigue either. There’s a nice, tall wall all around. So we go for more of a secret garden vibe. My mother routinely used Osyth’s tactic of leaving the vacuum cleaner out in the middle of the living room, but she didn’t fool anybody. Well, yeah, if you are expecting those guests, really, you don’t even put away the vacuum cleaner? Looks like the main value was that she didn’t beat herself up over the mess. To me that’s reason enough to leave it out. I have neither lawn nor potager. I have rocks with weeds growing up through them. Every once in a while I poke through the rocks and plant something. If it grows, I am wildly happy. The bushes I bought at that beautiful garden show you recommended look to be growing, even though I abandoned them, newly planted, to a week-long heat wave. Those are my kind of plants. I actually do have a hardscape plan. So I’ll juggle what I want against what I can actually do. Over time, something will get done — I’m not sure what but frankly, I’m grateful for what I have now. I love Christopher Lloyd. He was the only garden writer who made sense when we first moved to London. I bought the Well-tempered Garden and was so impressed I wrote to him to tell him so. He wrote back, a very kind and sensible card, which I still have and treasure. Wow. I would treasure that note too, pull it out every time my garden was driving me crazy. Yes, I can do a screen. Rebecca, my garden designer, wants to put a screen in the back: a curved line of plane trees, with more formal planting — a screen hedge and the like — in front and a lawn/meadow/TBD behind. I really like it. The question is how much I can do without moving the rocks. Plus of course you want to get your hardscape done before you plant very much. To some extent I’m planting things that I won’t miss too much, if the next wave of workers destroys them. I don’t know about pots. I always worry that they will dry out too fast. Remember I’m here only about half the time. Maybe if they were really big it would be okay. It’s an interesting thought. Thanks. I`m glad you like Christopher Lloyd: he made me see how to work with what you have and to try the odd rare thing. If it doesn`t work…well, you tried. What about planting – or sowing – garrigue plants? 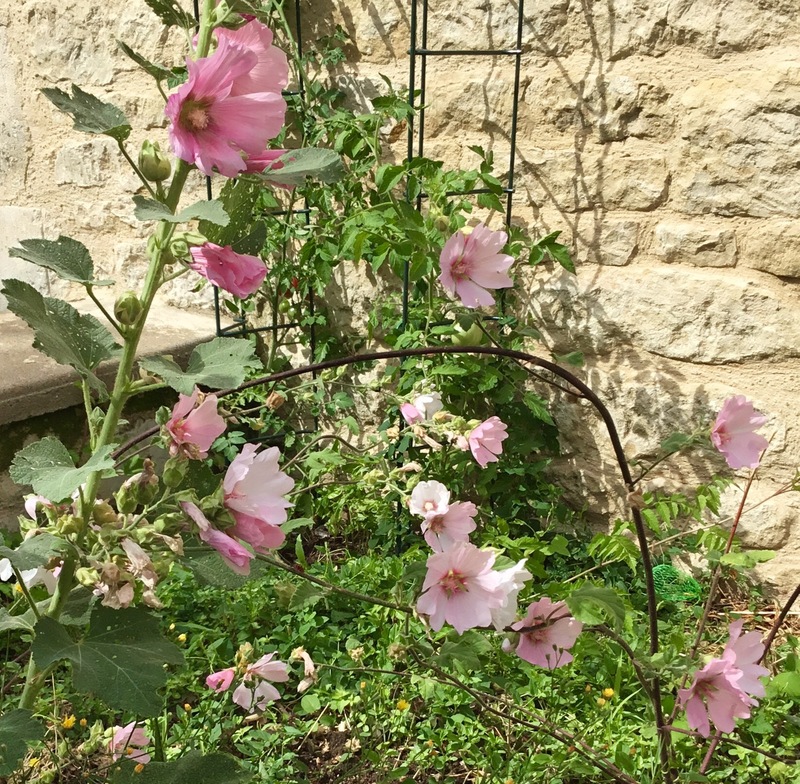 I am out of touch with French weather now but once established they would cope with neglect…and your rocky plain might be well drained enough to let them live through the deluges. That’s a great idea. Those are the kinds of plants that I used in my California garden. When I moved into Robert’s house it kind of perched above a desiccated lawn. It looked as if, any minute, it would lose its balance and topple right down the hill. We scrapped the lawn and put in taller drought-tolerant bushes that gave it a context, plus they attracted bees, butterflies and birds like crazy. Here I don’t have a hill and the soil is quite fertile, thanks to generations of pigs doing their thing. Neglect, though, I’ve got that going on. I have been sneaking in plants like that, off in odd corners that I know I won’t get to. Being more intentional about it could be very interesting. I could use Rebecca’s axial, formal plan to put some order into the loose, billowy ceanothus and all. I like it. Thanks. Next Post But is it Art?